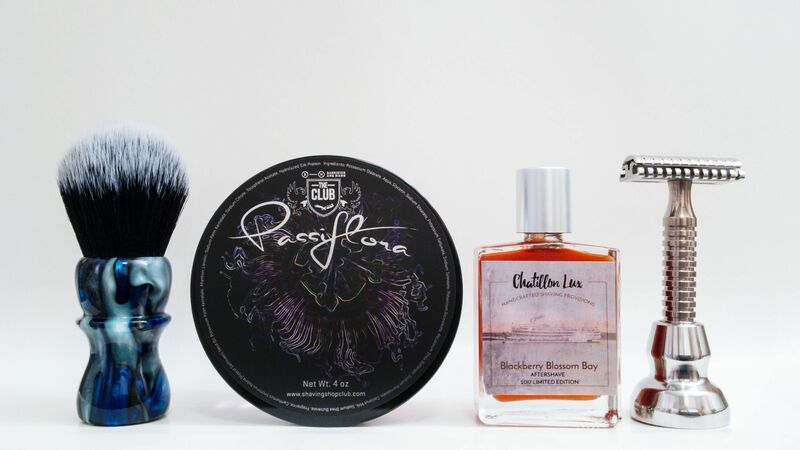 Shaving Product Review - Barrister and Mann "Passiflora"
Ahoy, maties! Join yer capt'n on this #HumpBay shave in search o' the sunken treasure that be Barrister and Mann Passilora #soap with a swig of Chatillon Lux Blackberry Blossom Bay #aftershave! ...Passiflora, an elegant, sophisticated, spicy fougère that plays on the green soapiness of galbanum oil. This unusual inclusion is buttressed with cinnamon, bergamot, rose, geranium, lavender, and tonka bean, and overlaid with the rich, tangy, slightly acidic edge of a truly fine passion fruit accord. Scintillating and distinguished, Passiflora is a modern fragrance for the modern man. It’s time that fruit had its due. As luck would have it... I did a pretty extensive review of Passiflora and Blackberry Blossom Bay in one shave before. How it has been nearly a year since that shave, I will never know. In any event, the two scents just call to each other. One's a fougére with a spin - the other is a bay rum with a spin... The fruitiness of both crosses boundaries in divine fashion. Passiflora is a "passion fruit fougére" while Blackberry Blossom Bay is a sort of "anti-bay rum" and my favorite take on a classic. Along the lines of Dr. Jon's Anne Bonny or Barrister and Mann Bay Rum in that they're not straight-up, classic bay rums; the twist in this case blackberry blossom. The two together are just lovely. Of course, another great bay rum inspired scent, though "not a bay rum" is Tallow + Steel West Indies - but that's a story for another day. Also, since I did that review of Passiflora previously, along with all the llama drama surrounding it when it dropped, I won't add anything further today regarding this unobtainium. Everything you need to know is in those two posts. Finally, I just want to briefly mention (again) Blackberry Blossom Bay - the sillage starts off at a strong medium (and never really dips below a lighter medium) with a longevity of 12+ hours. That in and of itself, is amazing. For a bay rum scent, it's unheard of. This stuff is amazeballs. The Timeless Razor is just so smooth, and not nearly as moody as the R41 is. The #WildWestBrushworks brush did the lather true justice in the #GTP scuttle. End result? A BBS shave like I haven't had in a good long while - one for the books. Sure, I've come close many times - but it seems like the more days worth of growth you're cleaving, the better the shave. I'm not sure what else to say, except, "damn, what a shave!"